Photo of the 2019 Cayenne Turbo courtesy of Porsche. 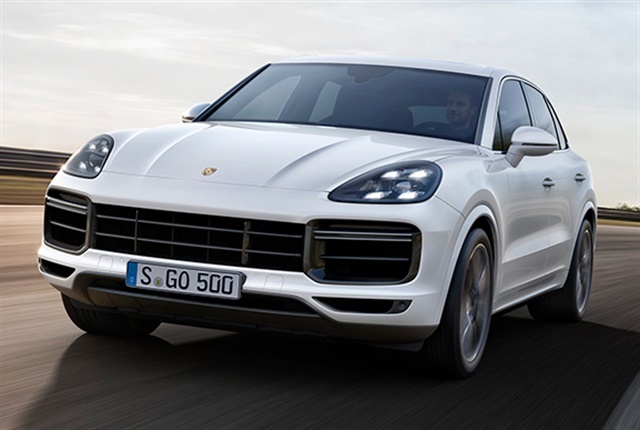 Porsche will offer a third, higher performance variant of its Cayenne luxury mid-size SUV for 2019 called the Cayenne Turbo that will provide peak 550 horsepower and 567 lb.-ft. of torque, the automaker has announced. Porsche unveiled the 2019 Cayenne Turbo at the Frankfurt Motor Show. It will slot above the base Cayenne and Cayenne S.
The vehicle will be powered by a 4.0-liter V-8 engine that's twin-turbocharged, while the Cayenne will be powered by a 3.0-liter turbo V-6 that makes 340 hp and 332 lb.-ft. The Cayenne S is equipped with a 2.9-liter twin-turbo V-6 that makes 440 hp and 406 lb.-ft. The Cayenne Turbo can achieve zero to 60 mph in 3.7 seconds and reach a top track speed of 177 mph. It will retail for $125,050 and should arrive in the fall of 2018.